The kind folks at Marx Foods sent me some amazing black garlic to sample awhile back. There's something about garlic and smashed potatoes that makes me happy, so I thought to myself, "how about black garlic smashed taters?" Black garlic is amazing. It's got a sweet, umami flavor that packs a lighter punch than conventional garlic. It is, in fact, conventional garlic, but it has been fermented at a high temperature for a month, resulting in softened, sweetened, and blackened cloves. Read all about it black garlic here. Boil potatoes until tender. Drain the pot. Leave spuds in pot. While that boils, smash up your black garlic. In a saucepan, warm half and half and butter to a light simmer. When it gets to simmering, turn off the pot and pour it over the spuds. Mash together. Fold in cheese, garlic, salt and pepper to taste. 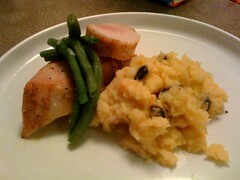 I served mine up with pork tenderloin and green beans. Yummy. We'll try that ish!